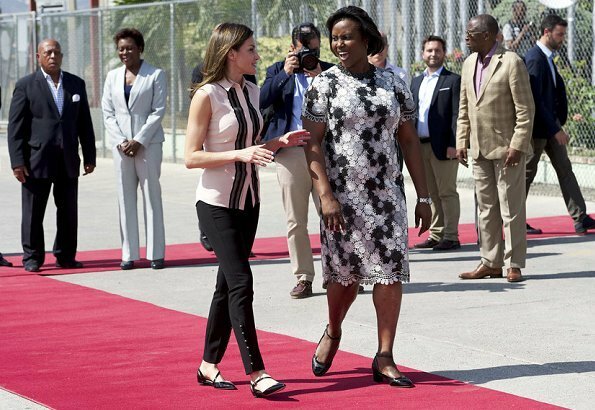 Queen Letizia of Spain is making a working visit to Republic of Haiti between the dates of May 22-23 to see on site the social projects initiated by Spanish Development Agency in Haiti. 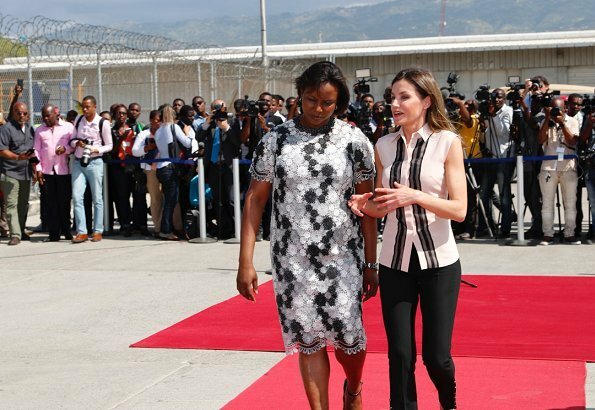 The Queen arrived at Toussaint Louverture International Airport in Port-au-Prince on May 22. 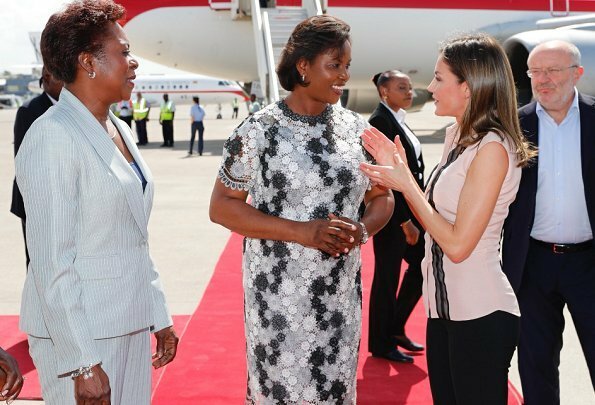 The Queen was welcomed by First Lady Mrs. Martine Marie Etienne Joseph at the airport. 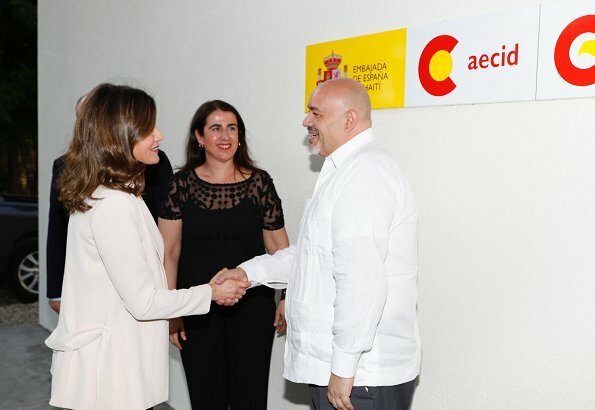 In the afternoon, the Queen attended a working meeting with representatives of Spanish nongovernmental organizations and international organizations at Haiti Technical Cooperation Office (AECID). The outfit at the meeting could have been worn for the arrival. Or, a black skirt with some volume. Or, the black and white combination above. Sorry Sofia: afschaffen die handel. Zonde van het geld. Wat een vertoning! Outfit for arrival very poor taste. Not respectful. I would agree that the arrival outfit it's a fashion faux pas, but not respectful, SMH. 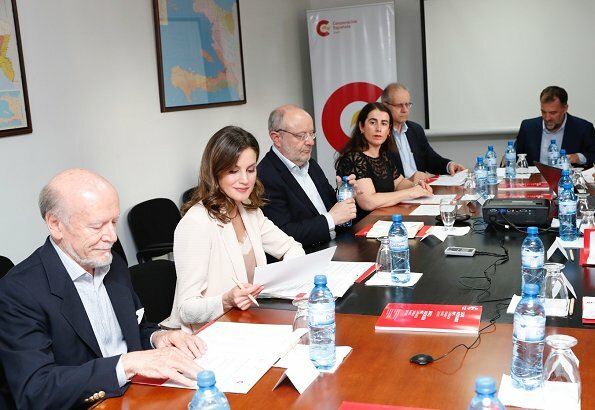 The top is part of a skirt/top ensamble, and it wasn't meant to be worn separately, least of all with this pants, which they look too "wintery" for the climate, it also looks like Letizia has gained a little weight, and it appears way too tight, A low cost summer dress with wedges, would have been more appropriate and regal. Why not respectful?? It's a very expensive outfit by Hugo Boss, most of Spaniards can't afford.. Anonymous @10:50, I can't understand your comment about wearing an outfit that most spaniards can't afford? I will venture to say that most citizens of the world can't or won't afford the outfits that we see in these forums. The Queen has her salary ( rather modest in comparison) like any other royal, or politician, and she can spend it any way she sees fit, and I don't see anything disrespectful in her choices. Cherry Blossom, they say it was disrespectful because they didn't like it, I meant it's very respectful because it's a good brand, just the contrary. Sorry, English it's not my mother tongue. I understand that this was probably her travel outfit, and she went for something comfortable. And she probably wanted this trip to be a bit low-key because it focuses on social projects rather than state affairs. 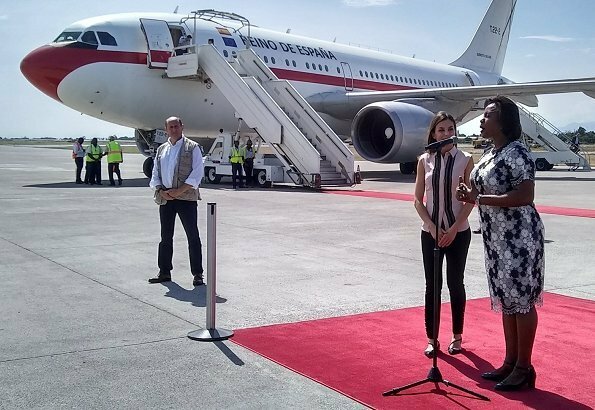 But still, if there´s an official greeting ceremony, with formal red carpets and you´re welcomed by the first lady of the country, you dress accordingly and not like some random tourist. The lady on the left with the pale blue/grey suit looks smarter and more appropriate than the Queen of Spain. Completely agree; this outfit was not appropriate. Haiti may be a poor country, and the day may have been hot, but when the local dignitaries are dressed more formally than a visiting queen, something is off. How cheap should her clothes be? Many outfits are repeated several times, the pink blouse and white pants on this trip for example. The face of Spain cannot be that of flea market bargains. 1400 euros in clothing for three days, that's my salary...in Spain.. The beautiful CH dress and the flowered skirt combined which were worn to meet 2 world leaders cost more than half of the 1400 euros. If we rely on your source, 2 items cost less than 50 euros. No Valentino, no Chanel as before, and no complaints then. Skin-tight pants are becoming a habit with Letizia, and that is very unfortunate. She is undoubtedly proud of her wafer-thin figure, but this is not an appropriate way to show it. She used to choose much more modest and beautifully-cut trousers which would have been a much better look for this occasion. She is so much more relaxed a outfit for every occasion. I do not care at all how much these clothes cost, but she would have been looking so much better in this situation choosing something else. Her clothes do not fit, are wrinkled, do not look good at all. Other people are much better dressed but the queen looks like she is going to beach walk. Spain has gone to help, no to show clothing, all that nonsense about respecful clothes is Anglo Saxon, Spanish show respect helping and carrying money from Spain to them, not fot queen the wardrobe..
Soy española. Aunque vayas a ayudar, tienes que vestir apropiada. No entiendo por qué llega a un país tropical con indumentaria cuasi invernal. La blusa le queda muy estrecha y no veo la necesidad de llevar esa precisamente, que forma parte de un conjunto. También podría haber llevado un conjunto mås claro, ligero y veraniego. Luego en España sale sin mangas en febrero. El top lencero también es de "cooperante"? All of the men and the lady official are all dressed in suits, not exactly tropical. Sleeveless blouses and black pants have now become quasi winter? In fashion, the runway shows are Spring/Summer, Fall/Winter, and Resort (vacation fashion). There is no quasi season where tight shirts are not allowed on planes because they area part of a set. The heat is suffocating when moving abruptly from spring to summer. This may explain why she changed so often, took off the blazer at the beginning, and did not wear many outfits with sleeves. Criticar por criticar sin el conocimiento adecuado. El top lencero también es de invierno y le queda apretado? Come on!! Y yo soy británica. Duly noted. The Haitian people were welcoming and kind. The children were cute, curious and on their best behavior. The Queen was interested and engaged while touring the sites, affectionate with her hosts and the children, relaxed, and joyful.